Every one of us has something in common. There is one area in life where we are all equal; rich or poor, young and old; no matter where you live in the world, what you do for a living, what you’ve done in the past or who your parents are; we all have 24 hours in a day. The average American family watches about 4 hours of television every day, which equals 28 hours a week. We can’t get that time back. The good news is that amount of time spent has decreased from a few decades ago when families watched over 6 hours of TV a day. The bad news is increased technology has given us many other potential time wasters with which to occupy us. Think about it; we have iPhones or cell phones, iPods, iPads, Blackberry’s, laptop computers, mp3 players, and old fashioned radio and television. Many of us have given in and have upgraded to a Smart Phone and yet we never thought we’d see the day when things we saw on The Jetsons in the 1960’s are now realities. The latest product of technology is another gadget right out of the space age: Smart Watches. Are these products making our lives easier or are they making life more complicated and time-consuming? We’re no longer talking about convenience or the old days when a calculator, TV remote, can opener or microwave oven actually helped us save time. Technology is not going to stop – or I should say man will not stop chasing it – but we have some important choices to make regarding how we spend our time – our most valuable commodity. Until the day we die, we can always buy another gadget, but we cannot buy more time. 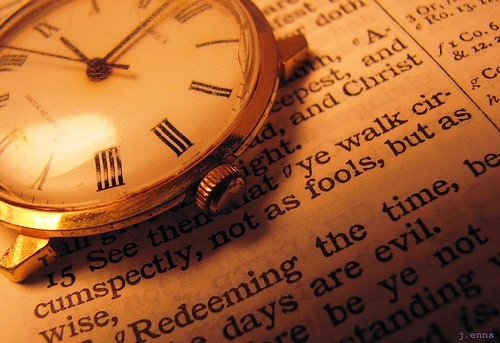 It’s time we go to the ageless wisdom of the Bible. According to eMarketer and others, in 2013, the average amount of time people spend engaged in all forms of media daily has now risen to 11 hours, 52 minutes a day! This means many of us are engaged with some form of screen or technology rather than having a person to person conversation or interaction. With nearly half of our allotted 24-hours a day being consumed, it should be shocking to some of us when we consider there are no guarantees we will live to a certain age. After all, most of us need at least 7 hours of sleep and about 3 hours for eating meals and getting ourselves cleaned up. Our houses sure must be messy. Sadly, we tend to overlook what is most important; the living and breathing people God has placed in our lives. I’m sure you’ve heard the saying that nobody has ever, on their deathbed, said they wish they had spent more time working or watching television; they almost always say they wish they had spent more precious time with loved ones. Is it time to get your house in order? Yes, it will take a commitment, discipline, and a concentrated effort to better manage our time and make wiser choices, but in the end it will be well worth it. As the old hymn says, “Only one life, so soon it will pass; only what’s done for Christ will last.” What fruit are we bearing for eternity and what kind of legacy will you and I leave behind? We have just one chance to do God’s will.